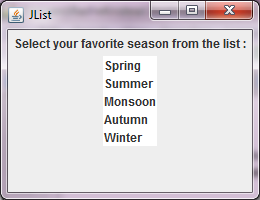 JList class is used to create a list with multiple values, allowing a user to select any of these values. 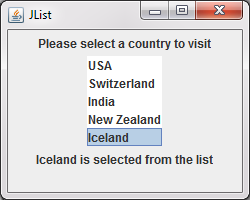 When a value is selected from JList, a ListSelectionEvent is generated, which is handled by implementing ListSelectionListener interface. 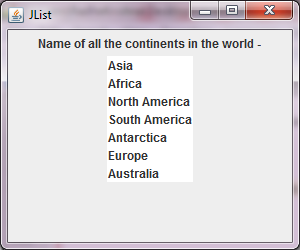 JList is another lightweight component which extends JComponent class. public JList() Creates a JList with an empty, read-only, model. public JList(E items) Creates a JList that is populated with the items of specfied array. 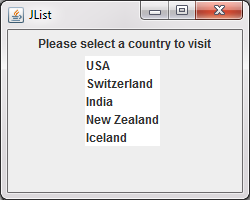 public JList(ListModel <E>) Creates a JList that displays elements from the specified ListModel. public void addListSelectionListener(ListSelectionListener listener) Gets a String message of JList. public void clearSelection() Appends the text to the JList. public E getSelectedValue()) Gets the total number of rows in JList.